Copyright by Scott B. Smith Photography, Whom We Thank Very Much. Naming Rights American Airlines will pay approximately $42 million over 20 years beginning in 1999. 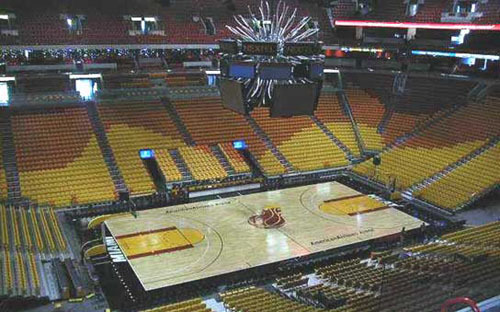 1992-1999 - Attendance for Miami Arena, Miami, FL. MIAMI (AP) -- A new downtown arena under construction for the NBA's Miami Heat caught fire Friday, sending smoke billowing across the city's waterfront skyline. Flames could be seen shooting from wooden construction material on an upper section of the $165 million American Airlines Arena. February 9, 2000 & January 19, 2002 - With all the hype surrounding the opening of this spanking new arena just two months earlier, we were anticipating having our socks knocked off when we got to this place. But even though we were impressed with the arena, it did not meet the high expectations we had placed on this venue. The American Airlines Arena replaces the former home of the Heat, the "old" Miami Arena, which is located three blocks away. We say "old" somewhat sarcastically, since Miami Arena is less than 20 years old. Yet in this day and age of club seats and premium seating, the old arena had become obsolete, though still used by the Miami Hurricanes college team. The NHL Panthers went their own way with a new arena 35 miles north outside Ft. Lauderdale, while the Heat went ahead with their new showplace right on Biscayne Blvd. in downtown Miami. The WNBA Miami Sol also play their games here. The neighborhood is a study in contrasts... right across the street to the south is a festive plaza, arcade and marina, with shopping, restaurants, patio bars and nightclubs in abundance. The ambience of this place is truly special. It is a great place to enjoy dinner or drinks before or after a Heat game in the warm Florida air, along with breathtaking views of Biscayne Bay and the causeways to Miami Beach. Cross over Biscayne to the east, and you will traverse Miami's worst areas -- homeless shelters, a dilapidated bus station, and impound lots surrounded by barbed wire fencing. Out of all this mix rises this imposing sports structure - a massive, stone arena with huge outdoor plazas; high tech in its architecture and the scrolling ticker boards running across the rim of the building. Parking starts at $15, with some lots at $10. The cheaper lots are over towards Miami Arena, but unless you want to walk through this rough area, we suggest you pay the higher fee and park close by. Meters are monitored 24-7, so if you park on the street you will be ticketed. The arena is laid out in such a way as to offer a maze of many varied concourses, all connected by short escalators. One of the most dramatic features of the arena is the floodlit mood lighting which is done in Miami Heat colors. The ground floor is bathed in bright red, the main concourse in orange and the upper level in yellow. Stand outside at a distance from the arena at night, and this looks spectacular. Go inside, however, and as you ride the escalators up, this lighting only accentuates the splashes of gray concrete and calls attention to the unfinished concrete work on the walls and ceilings. In fact, one can still see the etchings and measurement marks left by the contractors who built the structure. On our second visit, we were impressed with the tile work that was done to finish off the concourses, all in bright Heat colors, and the floor to ceiling advertising murals on the outside walls. There are several outdoor patios and balconies for the puffers. When you take a step into the warm air outside, you will enjoy a great view, no matter which direction you happen to look out on. Here we were more impressed - the "Heat' colors radiate like fire throughout the seating scheme from yellow to orange to red and then black. High in each end zone are two balconies which are opened only when the rest of the building is sold out. There is also a ground level club concourse available to rhose holding club seats. On both of our visits plenty of seats were available. The center scoreboard is a wonder - four sided video panels capped by smaller eight sided dot matrix info panels, the ad panels, and lastly, a tentacled sculpture in the shape of a sun which radiates light and special effects. On both levels are several nooks with seating areas and carveries offering sandwiches. Otherwise nothing more than the standard ballpark dreck. The main team store is at the ground level of the main entrance. On our first visit we saw the Heat do a big pregame show with light, fire, dot matrix effects and awesome music. It was pretty impressive to watch. What was really dumb, however, was the prelude to the intro, in which some local weatherman kept coming on like some newscast and advising of the weather front approaching Miami. They tried to make it look real, but it was all part of the show, and really cheapened the whole thing. Slam Dunk - When visiting Miami, as we said, check out the marina next door to the American Airlines Arena, and for other cool places to visit - we suggest Collins Ave in South Beach and the A1A strip along Ft. Lauderdale Beach. Assist - Built right into the arena is a practice court, but unfortunately, it is not accessible or viewable by the general public. Still a nice set up though. Assist - To Media Relations guys Tim Donavan and Rob Wilson for setting us up with an interview with Hall of Famer and Miami Heat Assistant Coach Bob McAdoo. All went well with the interview and it was a thrill to have the opportunity to meet one of the true icons of Buffalo sports. Foul - NO out of town scoreboard. NO announcement of scores. This is not a luxury or extra in today's modern venue, IT IS A MUST! Well we did come back, just to see if this place looked any better than the first time we came here. We were disappointed, though, to see that nothing much has really changed. This venue is high tech, unique in architecture and style, and reflects the Miami Heat theme and colors in a very nice way. Yet the atrium and escalator towers, which should be the signature of this building, are at the same time brightly floodlit and shabby gray, and that does not work well when viewed close up. However, there is one thing we REALLY like about the Miami Heat --- and that is our guy BOB MCADOO working as their Assistant Coach. So we close with that familiar refrain heard many a time at the Buffalo Braves games in the old Aud ----- "that's twooooo for Mc Adoooooooo!" Miami, Fla. - The Miami Heat is putting a full-court press on premium-seat holders and sponsors it claims haven't paid up. The Heat or affiliate Basketball Properties, which operates the American Airlines Arena, have filed 16 lawsuits in the past year against companies and people they claim owe about $1.6 million - if not more. At least a few of the cases have been resolved. The Heat has taken the most litigious approach among South Florida sports franchises to force customers and clients to honor agreements. By comparison, the Florida Panthers and affiliate Arena Operating Co., which operates Sunrise's BankAtlantic Center, filed three suits in 2008 to collect about $100,000. A search of court records didn't turn up any suits filed by either the Miami Dolphins or Florida Marlins in the past year. The Heat declined to comment on its suits. Royal West Properties, a Miami-based land developer, was sued in August for failing to pay almost $41,547 for six seats in Loge Box No. 224 that cost more than $71,000 last season. Ronald Fernandez, the company's lawyer, said the tough economy led to the dispute. "My client is a service-based company and if money doesn't come in from the people who have to pay, then its trouble," Fernandez said. "Nobody's getting paid. It's tough." Royal West recently resolved the suit and kept its premium seats, Fernandez said. Asked if the Heat changed the terms of the agreement, which ends after the 2009-2010 season, he replied, "They did work with us." He wouldn't elaborate, however. The Heat sued the Astri Group, the venture capital firm of convicted Pharmed owners Carlos and Jorge de C�spedes, to collect $55,930 for four eighth-row courtside lounge seats. The suit recently was settled "amicably and confidentially," said Isaac Mitrani, Astri's lawyer. "We no longer have tickets." The American Airlines Arena's latest financial results for the year ended June 30 don't reflect today's troubling times. Suite and premium-seating sales rose almost 7 percent to $22.7 million - representing half of the arena's total revenue. The arena turned a $6 million profit, compared with $6.1 million in 2007. The team doesn't report its financial results, which include ticket sales, television revenue and players' salaries. Some of those being sued by the Heat are making an unusual defense for why they didn't pay in full: The team was lousy last season. It finished with the NBA's worst record. Philips Arena in Atlanta, Ga. and the American Airlines Arena in Miami are the first arenas in the U.S. that hosts an NHL or NBA team to meet federal environmental operating standards for existing buildings. 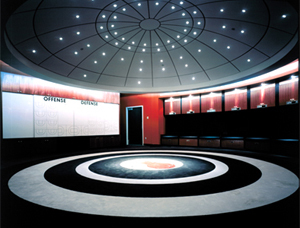 Rutherford Seydel, one of the co-owners of the Hawks and Thrashers, said at a press conference that the owners agreed to meet the standards with action such as installing new carpet with recycled material, compact-fluorescent lamps and more recycling. Water conservation measures have cut water usage by 2 million gallons over the past 11 months. Building officials didn't say what the work cost, but they hope it will eventually be revenue neutral. In Miami, the costs of the certification were low because the nearly 10-year-old building already included many of the electricity - and water-saving features to earn Leadership in Energy and Environmental Design or LEED certification, such as underground parking that produces less heat than above-ground asphalt lots. They also believe that energy- and water-conserving systems cut costs 10-15 percent a year, trimming about $500,000 off utility bills that now top $3 million a year. The actions also helped the Miami arena sign Waste Management on as a sponsor. The firm will work with the arena to improve and expand recycling programs. 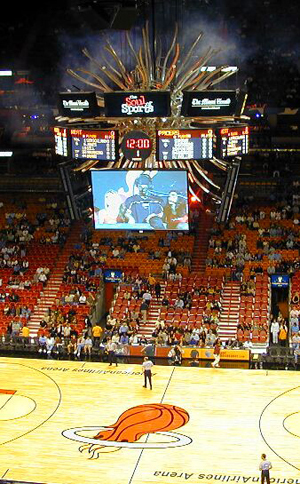 Miami, Fla. - A 3,400-square-foot LED curtain marquee has been added to AmericanAirlines Arena. The technology is a first for a sports venue in the United States. The stainless steel mesh does not obstruct views from inside the arena. It is 3/4-inch thick and 70 percent transparent. It will replace banners that now promote Heat games and other arena events, but will now be available to display advertising to the 65,000 cars that pass the building daily. The marquee was installed by A2aMEDIA of Boston which says it is in talks to put similar screens on other sports venues, hotels, shopping centers and other large buildings. The mesh uses one-sixth of the power needed by a similar sized LED board. Miami, Fla. - In the 10 years that American Airlines Arena has been open in Miami the city has not earned any revenue from the venue. Miami-Dade pays a $6.4 million annual operating subsidy to Heat entity Basketball Properties Ltd., established to build, manage and operate the arena. Under the 1997 contract, the county stands to gain a 40 percent share of arena net cash flow above $14 million after other obligations are covered. It's unclear when, if ever, that might happen. Before the county sees a share, money must first go toward arena operations and a capital replacement reserve, amortizing arena construction costs and paying management fees. Any shortfall in covering those areas and the arena manager must advance the money - which has happened. There's still nearly $28.2 million in arena manager loans to go after paying down about $4.55 million in principal last year, fiscal 2009 financial statements show, as well as about $2.5 million in unpaid management fees and accrued interest. The county can't see a penny until that's all paid back. Financials show that arena operating expenses totaled about $30.6 million in fiscal 2009. Revenue, including the county subsidy, reached about $52 million, netting about $21.5 million. Subtracting $14.5 million for arena cost amortization left less than $7 million in excess net cash flow, which went toward deductions for accrued interest and paying down some manager loan principal - leaving nothing in the pot of "arena distributable net cash flow." Miami, Fla. - State officials are considering issuing a notice of violation to the Miami Heat for advertising messages displayed on their LED sign outside AmericanAirlines Arena, the Miami Herald reported. The newspaper said the high-tech sign, installed by the Heat to great fanfare in May 2009, has become the focus of a simmering battle over the recent proliferation of billboards, electronic ads and commercial banners in and around downtown Miami. Like the arena sign, many of them appear to violate state, federal or Miami-Dade County rules governing outdoor advertising. The controversy over the sign also illustrates how overlapping signage rules and jurisdictions can sometimes produce contradictory decisions from different government agencies. The arena sign was OK'd by the city of Miami and the county, which owns the facility, although the state's decision may now trump both. Barbara Bisno, a retired federal prosecutor and co-founder of Scenic Miami, a new group that opposes billboards, filed complaints with the county, whose sign ordinance applies to commercial signs inside city boundaries. The newspaper said she also complained to FDOT, which regulates billboards along Biscayne Boulevard because it's classified as a state and federal highway. The issue with the AAA sign boils down to this: The Federal Highway Beautification Act of 1965, which controls outdoor advertising along federal roads to preserve urban and rural vistas, allows businesses to put up signs displaying their names and goods and services they sell on site. Signs advertising goods and services not provided on site - billboards - require a permit from FDOT, which enforces the federal rules under a 1972 compact with the U.S. government. But the AAA mesh exceeds the maximum allowable size of 1,200 square feet, and thus does not qualify for such a permit, Garner said in an interview. Bisno, citing the sign's manufacturer, says it measures 3,360 square feet. That doesn't mean the sign is likely to come down, Garner said. The simplest solution, he said, is for the Heat to stop displaying ads for goods and services unavailable at the arena. But the Herald said that's a conclusion the Heat has been contesting. The team's attorney, Stephen Helfman, had been pushing the state to adopt a novel interpretation that he says recognizes how modern sports arenas operate. Because the providers of those advertised goods and services sponsor the Heat, concerts and other activities taking place inside the AAA, Helfman said, the mesh does not require a permit. Helfman also said it was unfair of the state to target the arena because its sign was cleared by both the city and the county. Miami, Fla. - City of Miami commissioners are set to vote to rid the downtown neighborhood surrounding the AmericanAirlines Arena of food vendors, who mostly serve fans of the Miami Heat, the Miami Herald reported. The ordinance would take effect immediately, meaning no new permits will be issued. And those with current permits would have until the end of September when they expire. Vendors would still be allowed to operate on private property, but that would require obtaining a separate permit from the city, the newspaper said. The reasons, city leaders and members of Miami's semi-autonomous Downtown Development Authority say, are numerous: Lack of cleanliness, competition with nearby restaurants, even danger to Heat patrons trying to get to crowded games. "As new restaurants open up, there's really not a need for street vendors," DDA Executive Director Alyce Robertson told the Herald. DDA members, whose goal is to promote business in the downtown area, voted this week to support the measure proposed by the city manager's office. The Heat supports it as well. If commissioners approve the measure, it would only affect the 10 or so vendors currently permitted for the area. None are there now � the Heat's preseason doesn't begin until October. Miami, Fla. - American Airlines Arena brought in a record-breaking $60 million in revenue in 2011, yet for the 13th straight year, the Heat won't be sharing any of those profits with Miami-Dade taxpayers, according to the Miami New Times. Under a 1997 construction agreement, the county provided $38 million of land so Heat owner Micky Arison could erect the $213 million venue, plus it approved a $6.4 million annual subsidy for operating the arena for the next 30 years. In return, Arison's subsidiary - Basketball Properties, Ltd. - would pay the county 40 percent of all profits over $14 million. According to Arison, not even last season's playoff run, which helped the Triple A generate $15 million more than it had earned in 2010, was enough to generate a payout, the newspaper said. Arison, via Basketball Properties, claims the arena is an extremely expensive place to run. Last year the Heat reported $47.8 million in operating expenses, resulting in only $13.2 million in profit. Those costs included "depreciation and amortization" that ate up $12 million. In fact, "depreciation and amortization" - what corporations define as the loss in value of its fixed assets such as kitchen equipment or computers as examples - has gobbled up $55 million of the Heat's revenue for the past five years, the newspaper said. Miami, Fla. - After nearly 15 years of not seeing a dime out of its AmericanAirlines Arena deal, Miami-Dade County is going after its piece of the $14 million a year pie, according to Miami Today. Deputy Mayor and county Finance Director Ed Marquez said the county will review the submission and compare it with prior agreements in hopes revenues will soon flow. When the county struck a deal with Miami Heat owner Micky Arison in 1997, government agreed to provide $38 million worth of land and pay a $6.4 million annual subsidy through 2027 in exchange for the $213 million arena. Unlike the Marlins ballpark deal, which does not require owners to pay any revenues to the county unless the team is sold, Arison was to hand the county 40 percent of all profits in excess of $14 million but has yet to make payments. While the arrival of stars LeBron James and Chris Bosh helped push the team to the NBA finals and generate more than $60 million last year, Arison claimed $47.8 million worth of expenses at the arena. While revenues rose $15 million, arena profits did not surpass the $14 million mark. In an email, Marquez said that "the goal of the county is to ensure that the AmericanAirlines Arena continues to be a world class venue and that it be maintained and operated in accordance with the agreements" previously set. Marquez said the county is to review the submission and hopes "to achieve revenue sharing as soon as possible." Miami, Fla. - Miami-Dade's inspector general has launched an audit of the Miami Heat's profit-sharing contract with the county, which has not received any money from the NBA team despite record revenues of $60 million in the Lebron James era. The Miami Herald said Inspector General Chris Mazzella is trying to determine whether any profits generated by the Heat should have been shared with the county under a joint agreement to build the team's $213 million arena on Biscayne Bay. "This particular contract had not been audited and we decided to take a look at it," Mazzella told the Herald, noting the audit should be completed in the next month or two. "We usually look at contracts that are supposed to be producing revenue for the county." Miami-Dade government, which has been reeling from deficits and layoffs, donated $38 million worth of land toward the arena and pays a $6.4 million annual subsidy toward the venue's operating expenses under the 1997 deal with team owner Micky Arison. 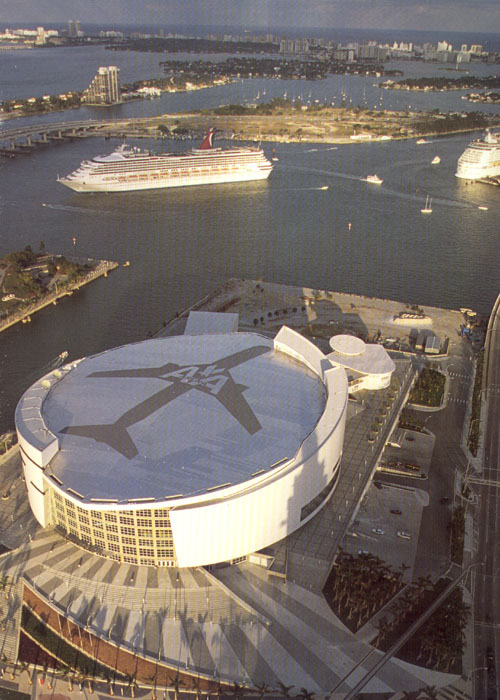 The facility was named the AmericanAirlines Arena. After the inspector general began his independent audit, senior county officials began their own review of Miami-Dade's contract with the Heat. Under the deal, the team is required to give the county 40 percent of all profits in excess of $14 million - a figure that the basketball franchise has never reported reaching since playing there in 2000. According to the Heat's financial statements for last year's near-championship season, the team generated revenues of $60 million. Revenues jumped $15 million with James joining fellow superstars Chris Bosh and Dwyane Wade in the lineup. But while the team generated profits of $13.2 million last year, those earnings fell just short of the profit-sharing threshold with the county. The reason: $47.8 million in operating expenses, according to the Heat's financial statements. Deputy Mayor Edward Marquez, the county's finance director, said his office has been reviewing the Heat's revenues and profits as the county and team both prepare for the fiscal year 2013 budget season. His office has been gathering financial information from Basketball Properties Ltd., which is expected to deliver its budget in May for the fiscal year starting July 1. "We're trying to get ahead of the curve," Marquez said. "We want to be able to live up to the terms of the contract. We want to effectively manage the contract." Concert industry publication Pollstar ranks the arena seventh in the nation and 18th in the world, with 340,000 tickets sold from January to September last year. The AmericanAirlines Arena has become the latest venue to announce the addition of an exclusive club area, following the BankAtlantic Center in Sunrise, Marlins Park and Sun Life Stadium. The Heat Group announced a partnership with Los Angeles-based hospitality company sbe Entertainment Group - which is about to open a hotel on South Beach - to develop Hyde AmericanAirlines Arena, a posh lounge that will cater to VIPs and premium ticket holders. The lounge, scheduled to debut in late October for the 2012-13 basketball season, will be open during Heat games and concerts and available for private parties. The Miami Herald said it could also operate for promoted events when the arena is not in use. Just before game five of the Miami Heat's first-round playoff series with the New York Knicks, code enforcement officers ordered the team to take down the white banners, which carry the slogan "DRIVE to the CHAMPIONSHIP" printed sideways above the image of a car tire and a Heat flaming-basketball logo. Two weeks earlier the Miami Commission killed a bill to allow the banners on 16 royal palm trees in front of the team's arena. The team, which manages the arena, didn't apply for permits, Alice Bravo, assistant city manager, told the Miami Herald. The Heat refused to take the signs down. In a statement, spokeswoman Lorrie-Ann Diaz said the team would remove the "sponsorship message" from the banners but leave them up "until the end of the playoff run" while applying for a permit. Bravo said she was uncertain whether the tree banners without an advertising component would be permissible on the arena property itself, but added that she believes draping banners on palms on the public sidewalk is not. The festooned trees are on both the arena steps and the sidewalk out front.